Celebrate Independence Day With Our Favorite Fourth of July Treats! This Fourth of July, it's time for you to show your people your patriotic food skills! All the ideas posted below are simple and easy to make and are sure to please your crowd. Choose from fruit based treats or sugary sweet delights. Grab a pen and paper! It's time to celebrate independence day with our favorite fourth of July treats! This is a great alternative to traditional sugar highs and sheet cakes! It's a quite simple recipe! Simply lay out a thin layer of cookie dough on a cookie sheet and bake. When done and still warm, place assorted sliced fruits (maybe strawberries, blueberries and bananas) on the cookie as it cools and sets. Top with a thin layer of vanilla yogurt, whipped cream or ice cream for a finishing sweet touch! This one is an easy July 4 themed spin on kettle corn. All you need to do is make your popcorn like you normally would but add food coloring! For a healthier version, make beet juice and toss the kernels in the juice before you pop! Add salt and enjoy! 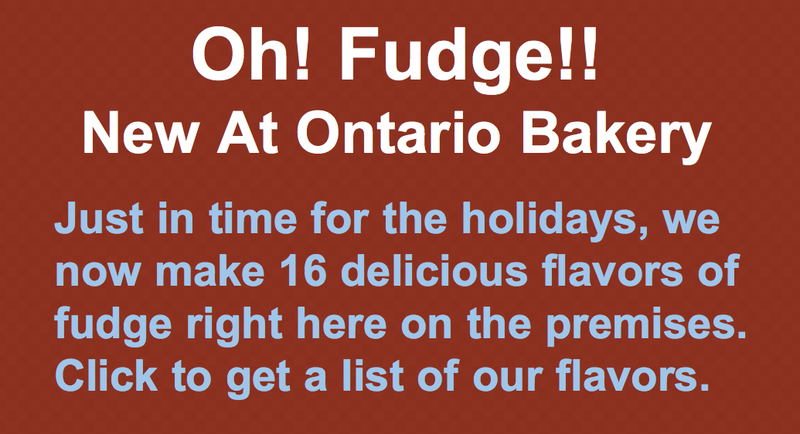 At Ontario Bakery, we LOVE our cake pops. 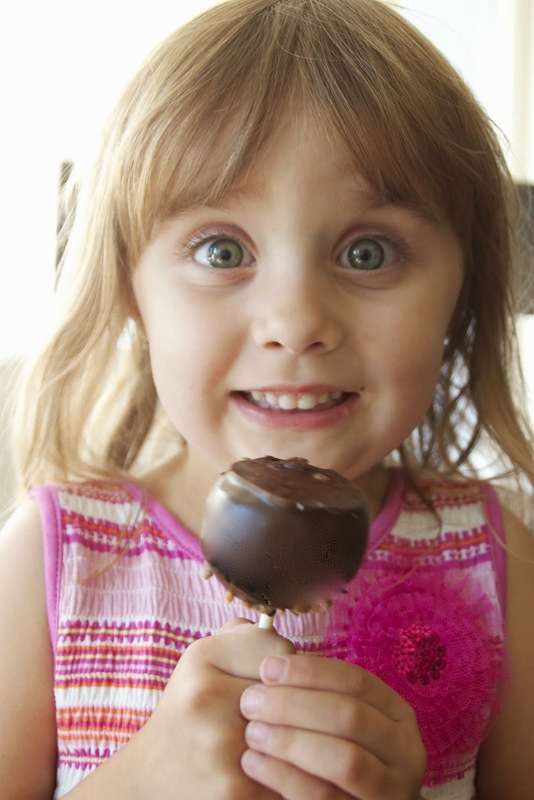 So why not get some custom cake pops made just for your celebration? If you are in the mood to do it yourself, mix red, white and blue icing with various patriotic sprinkles and decorations. Pop them on a stick or display as an American flag. If that feels like too much, just give us a call and we'll take care of it for you, so you can relax! Fruit skewers are a fabulous healthy option and they're simple too! These snacks are a great alternative to all the heavy potato salad, burgers, and potato chips that are normally found at barbecues. Present the fruit skewers as your table’s centerpiece, dip the fruit in chocolate to make a sweet treat, and let your kids get in on the action by creating an assembly station. While we don't recommend your cake really explode, it's a great idea to run with! We would be happy to do create this custom cake for you or you can do it yourself! A full recipe can be found on the blog Cooking With Sugar- where she gives all the details on how she went about making this festive cake. Everyone will be thrilled to see your skill or at least choice in dessert! If you show up to a Fourth of July party with this plate in hand, we guarantee that people will be impressed! This patriotic platter is amazing because it's SO easy to do! All thats needed are the right sliced up colors organized into a flag on a plate or platter. Feel free to use cheese, bananas or even pineapple for the white space! We are excited for you to enjoy this holiday in the best way way possible and we at Ontario Bakery are ready to bake up what you dream up this independence day! Celebrate the 4th of July by Keeping it Safe, Fun and Delicious for Kids! Fourth of July means celebrating American independence with friends, family, BBQ and fireworks. We know you won't be letting your little one crawl around with a lit sparkler, but small children are curious creatures, so let's talk about a few ways to make this years celebration safe, fun and delicious! No matter what you do or where you go, you can celebrate easily by sporting your red, white and blue. Dress the kids up in their favorite accent colors and let them have fun with it! Get temporary hair color and die the ends of pony tails red or blue! Your kids are going to look adorable so be sure to have your best colors on too! Photo ops will be abundant and you want to be caught looking good! Keep your BBQ stocked up with palate pleasers! You can have watermelon for kids of all ages, but especially the babies! (you may want to dress your toddler in red, to hide the juicy mess) Corn on the cob is also good for the younger ones.. and adults! Also keep in mind that, although well-meaning, relatives are likely to want to hand out candies and ice cream to cute little ones. This being said, they could end up with 20 pieces of candy in an hour if no one catches on! So, solution is to provide plenty of fruits and healthy snacks and have one big cake that everyone can dive into later! There are definitely some states out there that have outlawed the use of personal fireworks, but others haven’t. So either keep your little ones inside if there are people running around with lit sparklers. Keep in mind that fireworks don't always behave the way they are intended to. Bottle rockets can go the wrong direction, sparks or strings may whiz and go hay wire, a string of firecrackers may be accidentally flung your way and those sparklers can cause burns if someone doesn’t notice your little one in your lap and runs by. Also, the loud noise can be hard on little ears, if not downright dangerous. If you do want them to enjoy the fun, consider making a marked safety perimeter for people to stay behind. If your city has a fire works display or performance, by all means, go! Just check out ahead of time about the place you can watch from a respectable distance, in case it ends up being too frightening for the smaller kids. Be sure to bring ear protection to lessen the shock, or to allow younger babies to sleep while the rest enjoy the festivities. Safety and fun can definitely go hand-in-hand during this year's 4th of July celebration. With the right colors, foods and entertainment, it's sure to be a memorable one. Definitely take plenty of photos and have fun!! For custom 4th of July cakes and favors, visit Ontario Bakery. From us to you, Happy 4th of July! It's Fruit Season! Here Are Some Great Ways to Enjoy Cherries this Summer! Yesterday, we drew you in with the many ways to enjoy strawberries, and today, it's time to get you thinking about cherries! Cherries are great because they are known for having quite a few health benefits. They have been shown to lower cholesterol and triglycerides, reduce inflammation, arthritis, and pain, and help stop weight gain. If you eat about 10 cherries each day, the week before menstruation women have said you will experience an easier cycle and reduced cramps. Some reports have even said that eating 20 cherries a day can ward off inflammation altogether. They also contain a high amount of antioxidants which are vital for preserving cells and protecting them against damage from free radicals or cancer. Red cherries have melatonin in them, which helps fight disease-causing agents and supports better sleep. A good source of Vitamin C and fiber, cherries are a low-fat, low-cholesterol, low-sodium food, making them a great healthy snack and dieter’s friend. Just remember that the darker the cherry, the more nutrients and health benefits it has—and sour cherries have more health benefits than sweet ones. Now that you're really craving them, here are some great ways to enjoy cherries this summer. Make them chocolate-dipped. Just like strawberries, cherries LOVE chocolate. Go all out with this one and treat your backyard party to some cherries in fondue! Be sure to have a bowl for the pits. This one will give your gifts a little classy with a little messy! Cherry Coke. Grab a traditional coke or one of the great natural brands of cola, pit and slice some cherries and drop them in the glass! Let it sit for a few minutes and then enjoy your own real cherry coke! Cherry Morning. Many breakfast bars and cereals contain cherries, as do some flavors of yogurt. Why not make your own? Add sliced cherries to oatmeal or yogurt and know that the cherries are fresh with nothing artificial added to them. If nothing else, blend the cherries in with your morning protein shake! or yogurt. Cherry Candy. Pit and freeze cherries and grab them instead of candy. They’ll be sweet enough to satisfy your sweet tooth without adding too many calories, and with the added benefit of nutrients and antioxidants. Added bonus? Roll them in natural chocolate syrup and *then* freeze them. YUM. Cherries and Cream. Who doesn't like cherries in their ice cream? Cherry Iced Tea. Freeze cherries and then drop them in your cup of iced tea for a cute and yummy way to add flavor and flare to your drink! This is a great party idea! Make sure you try different varieties. If you don’t like the tart varieties (Morello and Montmorency cherries), try something sweet, like Bing, Royal Ann, Rainier, or Lambert cherries! Remember... darker ones are higher in antioxidants! Ready For A New Treat? 5 New Delicious Ways To Enjoy Strawberries in the Summer! Strawberries are in the peak of their season and that's cause for celebration! At this point, what we need are some exciting and delicious new ways to enjoy them so we don't get bored of this seasonal favorite! So let's think outside shortcake and get our taste buds activated. It's time to to sink our teeth into some fresh treats this year! Here are 5 new delicious ways for you to enjoy strawberries in the summer. Sweet Tooth Calling? Here Are Five Healthy Summer Treats To Sink Your Teeth Into! Summer is here and it's time to indulge in the healthier side of things! As the temperature gets warmer, our sweet tooth remains and it's nice to have some healthier options to direct our children and families toward. These can be hard ideas to come up with, so we've taken up that responsibility for you!! Get out your recipe pad and pen... it's time to get inspired! This is a great one! Have the delicious perk of apple pie without the guilt or heaviness. Here's what you want to do. Cut your apple into very thin slices and lay them down side by side, slightly overlapping. Finely chop cashews and toss with cinnamon, sea salt, pure maple syrup (to taste) and rolled oats if you like. Once the crumble is to your liking, spread evenly across the apple slices and serve! Easy as.... pie! Grab your favorite tropical fruits. Banana, mango, papaya, pineapple .... Cube each into bite size pieces and slide onto wooden skewers. Stick the skewers in the freezer and take out in a couple hours to enjoy. Kids love these, because they aren't overwhelmed with choices and they get the joy of a Popsicle without the extra sugar! This one is a true favorite! Grab your favorite frozen fruit and send them through a juicer with a double masticator! The result is incredible. You will have a purely fruit sorbet that everyone will love. For an added bonus, take the family or a few friends out to a u-pick strawberry field. Nothing tastes quite as good as the strawberries you pick yourself! Slice strawberries and set aside in a bowl. Finely chop fresh mint leaves and set aside. Next, pop open a lemon or vanilla flavored yogurt and add to bowl of strawberries. Sprinkle the top with your mint garnish and devour. Your taste buds will thank you.... you're welcome! There are many ways to cool off and satisfy that needy sweet tooth of yours, in the summer time. For more ideas or a warmer delicacy, please call us at Ontario Bakery and we'll be sure to create you the sweetest treat for your every celebration need! Fathers play a critical role in the development of their children. Though we don't need proof, research shows that fathers who are actively involved in raising their children can make a positive and lasting difference in their lives. And in the spirit of Father's Day, we'd like to point out all the great reasons kids need their dads! Listed below, are 20 reasons why your child needs you to be an active father. emotional support from their parents. Active fathers listen with their whole hearts and support their children when they experience joy, sadness, anger, fear, and frustration. Fathers who support their children emotionally tend to raise children who are more in-tune with the needs of others. greater problem-solving and social skills. 12 Reasons Dads are Awesome and Should Be Appreciated this Father's Day! Regardless of when they come into your life, Fathers should be appreciated for the love, care, time and devotion they have poured into us. Some fathers start at the beginning, with giving you life. Some step in later to fill an empty void that needs their patient presence an then there are times when there are multiple homes and the kids just get that lucky gift of having 2 dads. It's safe to say that we all have an incredible dad in our life. Whether our own, one we've claimed later in life, an uncle, a grandfather or even the sons or son-in-laws that we are thankful for; for stepping up and leading the next generation. Whoever the father, here are 12 (sometimes humorous) reasons that dads are awesome and should be celebrated this Father's Day. 1. They gave you life.... Regardless of the journey, they are 50% of the reason you exist today. Be thankful. 2. Dads help out... Often doing the most unpopular tasks, Dad steps up to mow the lawn, take out the recycle, walk the dog or unload the dishwasher. Some are great handymen and don’t forget Dad’s job as the official spider-killer. 3. They secretly love tea-parties... Even if their etiquette needs improvement. 4. They tell Dad jokes... So a guy walks into a bar ... Ouch, those iron bars can really hurt. C'mon... we've all been there! 5. Dad's like to experiment in the kitchen and cook without recipes.... usually those recipes end in needing ketchup, syrup or hot sauce. 6. They rarely chastise their kids for playing with their food... In fact, they seem to encourage it. 7. Dads LOVE to wash the car... Even if they're not so great at cleaning the bathroom. 8. Dad's love dressing their kids up in the same stuff they wear... Or is that the other way around? 10. Dads are there to encourage you... Nobody thinks you’re smarter, more clever, or more accomplished than your dad. Well, maybe Mom, but it’s a pretty close tie. 11. Dads love to inspire... Your Dad believes in you. He gives you the confidence to be your own person, to be persistent and to follow your dreams. How will you celebrate dad this year? How will you tell your husband, brother, son, son-in-law how proud you are of them for stepping in to such an honorable role? At Ontario Bakery, we would love to be part of your celebration. 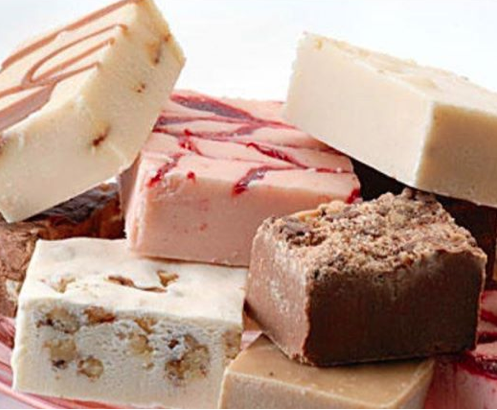 We are family run and owned and love supporting family with cakes, sweets and delights, whenever we can. Let us know how we can make your Father's Day the sweetest one yet!